Medieval city centers bathed in the warm glow of twinkly lights… yuletide carols ringing out in the crisp winter air… scents of hot mulled wine, grilled sausages and roasted chestnuts wafting through the town square. The Christmas markets of Switzerland create fairy-tale settings in the romantic Old Towns of larger cities and in picturesque mountain villages—enchanting places in themselves but all the more magical during Advent season. These festive gatherings bring back childhood memories and recall the Christmases of old. Origins of the Christmas markets that are so popular across Europe go back to the Middle Ages in German-speaking regions. Typical of traditional markets are clusters of wooden huts manned by artisans selling their handcrafted wares. You might even see the vendors at work—carving wood, making candles or decorating gingerbread. 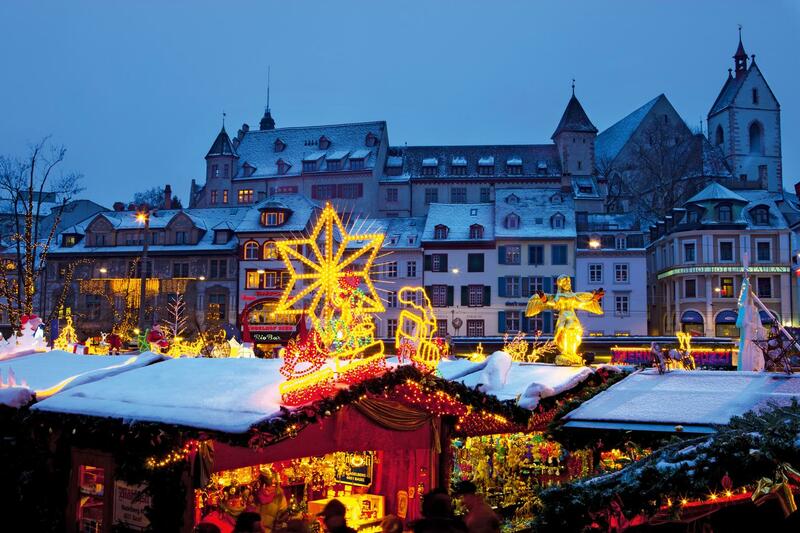 Almost all Swiss cities and villages have at least one Christmas market. The bigger markets start in late November and run through Christmas Eve, while those in small towns may be just one week or a weekend. 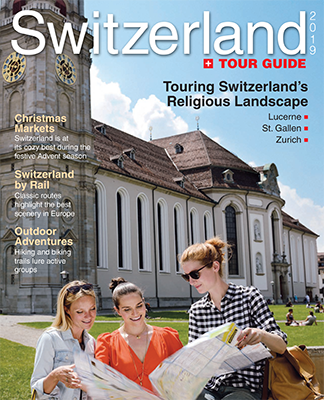 Not only do the markets showcase the best of Swiss culture, but they give travelers opportunities to shop for one-of-a-kind Christmas gifts. Drifting from stall to stall, you’ll find Advent wreaths, wooden toys and hand-blown glass ornaments. Perhaps a piece of jewelry or pottery will catch your eye. Rose-scented bath salts or a velvety soft alpaca wool scarf might make the perfect gift for someone special. Carnival rides, horse-carriage rides, choral concerts, barrel organ music, nativity scenes, gingerbread house displays and other special features, depending on the market, add to the festive atmosphere. Holiday markets offer a chance to sample foods distinctive to Switzerland and individual towns or regions. One wintertime favorite is Raclette, a semi-hard cheese whose steaming melted scrapings are served with potatoes. Dunking bread chunks into a bubbling pot of cheese fondue is another treat. Market-goers also will find freshly made waffles and crepes hot off the griddle, plus bratwurst and other sausages. Besides gingerbread, baked goodies include breads with nuts and candied or dried fruits, including Stollen, a Christmastime favorite in the German-speaking world. And who can resist a box, bar or morsel of Swiss chocolate. Drinks like hot chocolate, hot cider, spiced tea and Gluhwein (hot wine laced with cinnamon and other spices) will warm your insides on a chilly December day. At the Christmas market in Appenzell and St. Gallen in eastern Switzerland, you will encounter Biberli, a pastry made of gingerbread dough and filled with almond paste. In Zug, a local specialty is Zuger Kirschtorte, a cherry cake with schnapps in it. In the Rhine River city of Basel, try Basler Lackerli, a chewy biscuit made of honey, nuts and candied orange peel. 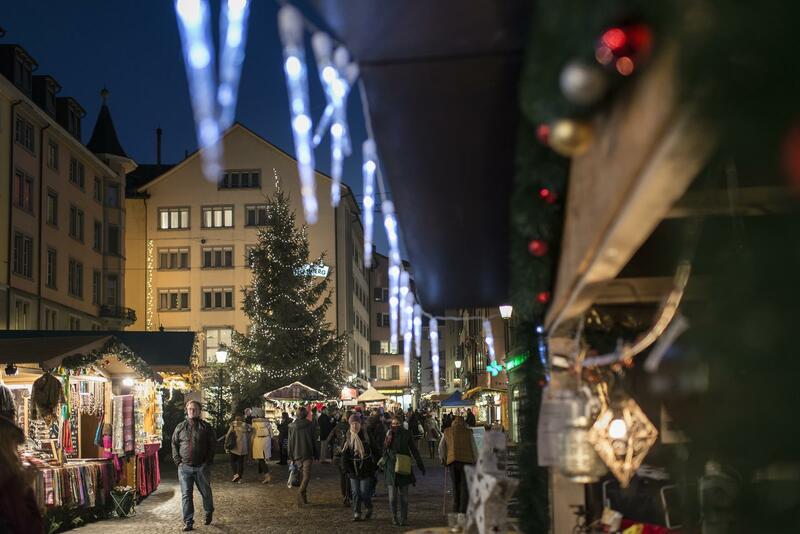 Two Christmas markets in Basel’s Old Town, with a total of almost 200 rustic wooden chalets, stretch over two squares, the Barfusserplatz and Munsterplatz. More than 100 Christmas trees adorn streets throughout the city center, with a magnificent tree on the Munsterplatz, site of the red-sandstone, twin-tower Cathedral, a Romanesque-Gothic landmark. The capital city of Bern also boasts Christmas markets on two Old Town squares, one dominated by the Bern Munster Cathedral, whose steeple is the tallest in Switzerland. 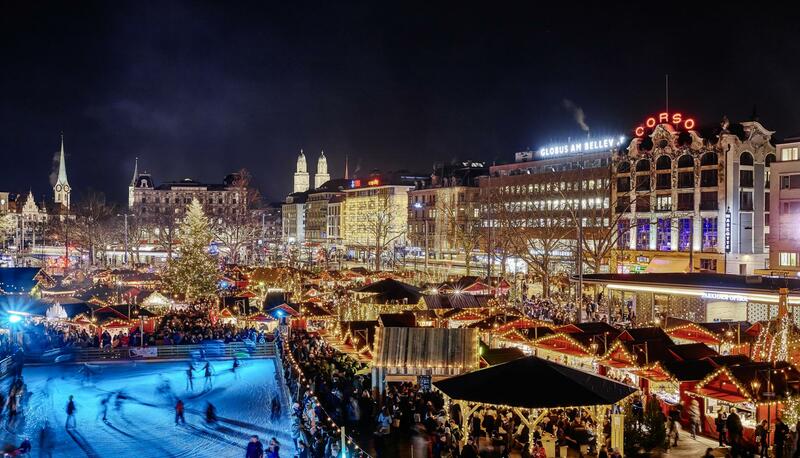 Zurich, the country’s largest city, also has more than one Christmas market. In the main train station (Hauptbahnhof), a 50-foot-tall tree decorated with thousands of Swarovski crystal ornaments overlooks 150 vendor stalls in one of the largest indoor Christmas markets in Europe. 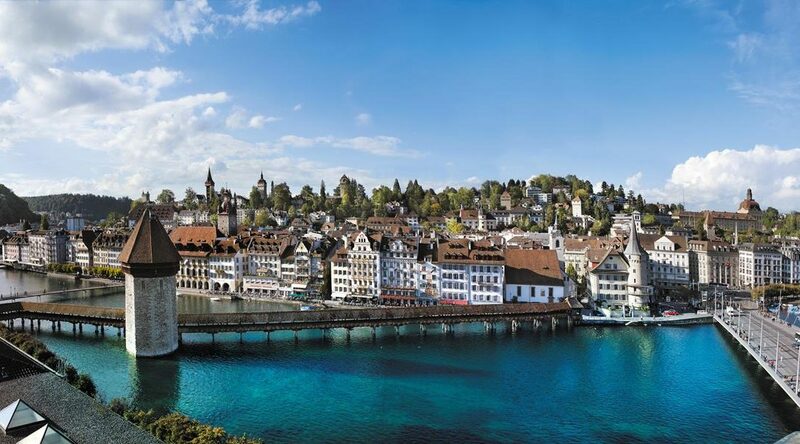 Across the Limmat River in the Niederdorf Quarter of romantic Old Town are more market stalls. Against the backdrop of the Zurich Opera House, yet another market beckons holiday revelers to Sechselautenplatz and the Christmas Village with its 100 stalls and ice rink. Rapperswil-Jona, a Lake Zurich town set amid medieval trappings and overlooked by a castle, offers one of the most romantic locations of any Christmas market in Switzerland. Featuring more than 200 market stalls, it’s also one of the largest in the country but lasts just 10 days in mid-December. 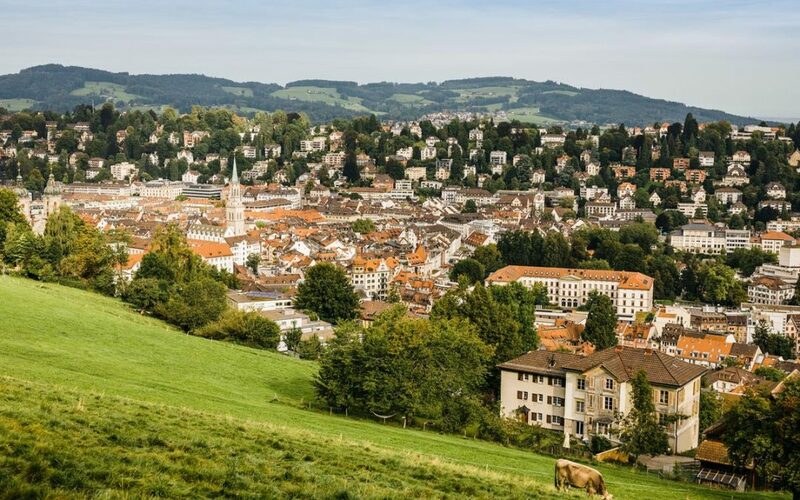 The week-long market in Einsiedeln, a small town in Central Switzerland, boasts a grand backdrop as well. 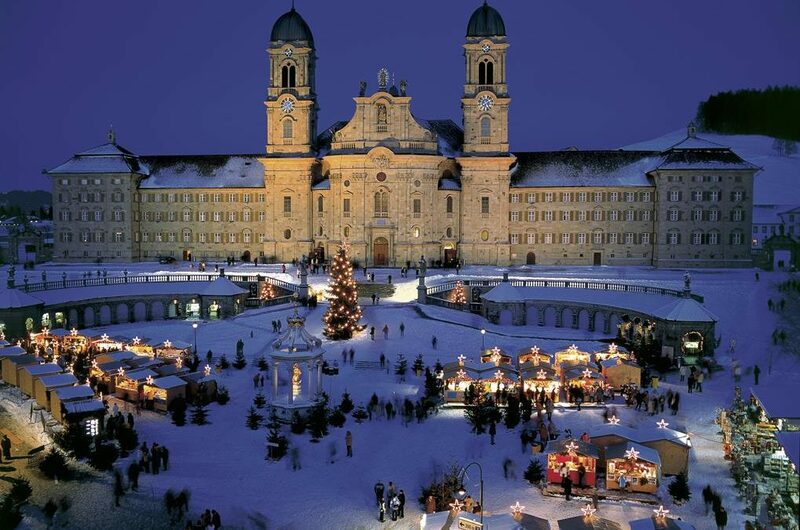 Running the length of the main street, it is spread across the square in front of Einsiedeln Abbey, a Baroque Benedictine monastery famous for its Black Madonna statue and a Catholic pilgrimage site. 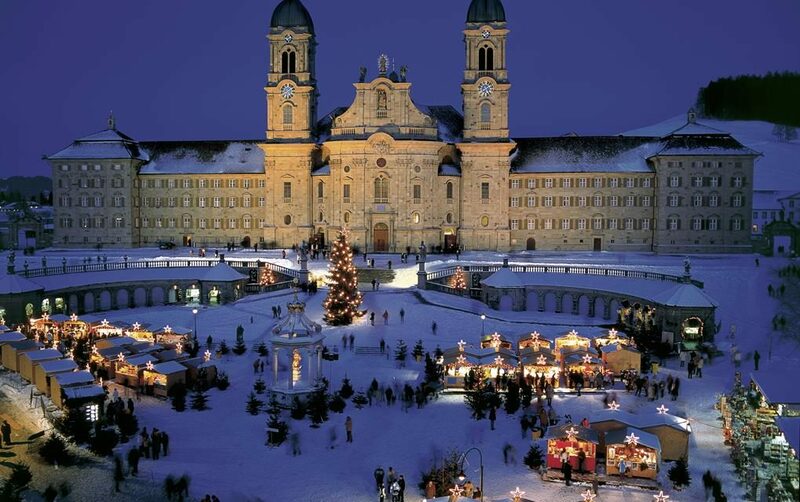 Einsiedeln’s Diorama Bethlehem nativity display, with 450 hand-carved figures, is said to be the largest in the world. French-speaking regions of Switzerland also get in on the holiday fun. Montreux Noel, a month-long, citywide celebration, is centered around a Christmas village right on the Lake Geneva waterfront. Wandering musicians serenade shoppers prowling the 160 decorated chalets, and there’s also entertainment under the roof of the Covered Market. Visitors can warm up in the Lumberjack Cabin, which serves wood-fired pizza, or enjoy fondue made from local gruyere cheese at La Poya. A giant Ferris wheel rises above it all. 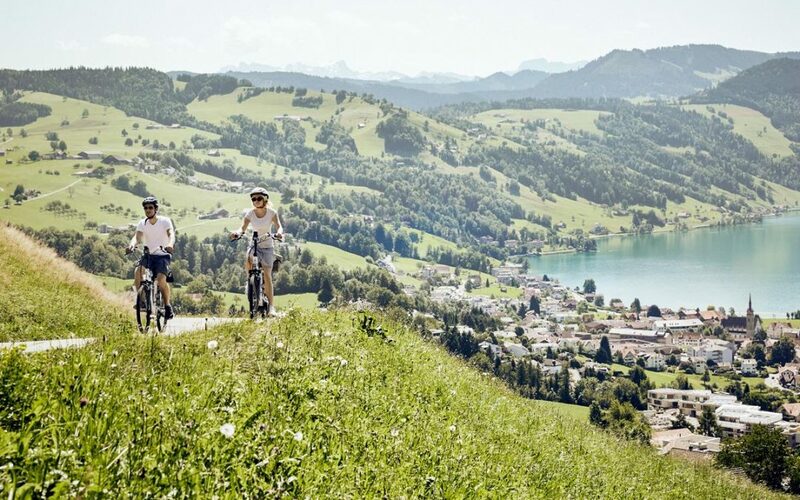 Switzerland, a small country blessed with mountains, lakes and storybook towns, is one of the coziest places on earth. Things get even cozier when the Christmas season rolls around.